Bulletin boards are a staple of any classroom. They can serve a number of purposes: provide information for students, serve as a learning center, and of course display student work. Bulletin boards can be used in any classroom, for any subject area and at anytime of the year. 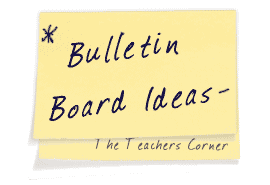 The Teacher's Corner has organized a great collection of bulletin board resources. You can find bulletin board ideas for all subject areas, seasons, birthdays, special events and more. These bulletin boards come straight from the classrooms of teachers around the globe. We are always on the look out for new bulletin board ideas, so email us your idea today. Don't forget....there may be some topics that overlap different pages. So, check it all out! These boards focus on events specific to each of the 12 months. If you are looking for seasonal themed bulletin boards, check their corresponding months in this category for more ideas! 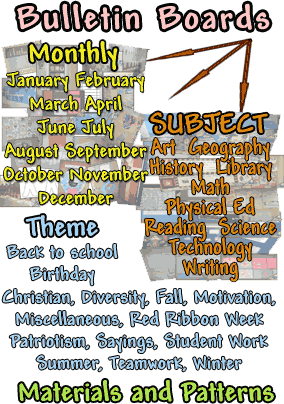 Find boards in multiple subjects including: art, geography, history, library boards, math, physical education, reading science, technology and writing bulletin boards. Find everything from Seasonal, Back to School, Birthday, Motivational, Teamwork, Diversity, Special Event bulletin boards and more. If you are looking for bulletin boards specific to a month, you may find them in their corresponding season in these themed bulletin boards, so check here as well. Find new and creative ideas and materials to spruce up your boards! Download and print TTC original patterns to use on your bulletin boards. Patterns for flowers, leafs, bells, ghosts, christmas trees, turkeys and more. Also see our massive library of Lesson Plans, Teacher Resources and don't forget our great map-based Pen Pals!